What parts have you replaced? I suspect the motherboard and the stepper drivers/fan, what about the LCD? there a big possibility that when the board got fried the lcd screen went the same route. Have you measured the output from the power supply, is it a stable 24v? Another real possibility is that you have reversed both the LCD cables either in order or in orientation, double check those. that would cause the non stopping beeping. After you try these please report back. I have replaced the Motherboard, all stepper drivers, the Y-stepper (it froze), both cooling fans for the stepper drivers, the power supply, the lcd screen. I have not measured the power supply output, but I can check that. I thought maybe I had the cables reversed, but I double checked them and they looked right. I think I downloaded the latest firmware, but I might not have. Other things of note, I bought a MKS Gen V1.4 instead of the original V1.2 and I also got the A4988 drivers instead of the DV8825, though I do have a new set of those too. Can someone give me a direct link to which firmware I would need? I am really bad with firmware and have almost zero experience. Can you please share the links o the components you ordered, that is in case you did not order from Beeverycreative as there are some clones of the same LCD that helloBEEprusa uses, or even some version of MKS gen 1.4, have the connectors for the LCD reversed (the orientation notch in on the wrong side), causing the problem you mentioned, there is an easy fix but I need to be sure before I can try and help you. If possible post a photo of your board and LCD so I can verify the LCD output and input have the correct orientation. As @DomingosRodrigues said previously, that looks like an LCD cable issue! I don't know why they did it but I think the LCD connectors on the motherboard changed orientation from MKS GEN V1.2 to MKS GEN V1.4. On one version, the pastic notch is torwards the inside of the motherboard, on the other version it points outwards. 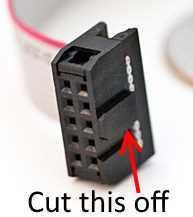 then connect it as if it was connected to a mks gen 1.2, with the notch you just cut facing the top of the board. Nice! Let us know how it goes. I have finally made some progress on my printer. I decided to order the original version of the board and then it took 2 months for it to ship from Hong Kong, grrr. But it is in and installed and I have a working printer, kinda. I am still having three problems I am hoping for help with. A) Fan on Extruder 1 which should always be constantly on isnt. It is twisted in with the wires of the other constand on fans. I am guessing it is dead and needs replaced. This shouldnt bee too much of an issue, I just cant use E1 unril that is fixed. B) Heated bed begins heating as soon as I turn the machine on and finally levels off at about 123C, which is not great for printing PLA. The screen shows a temperature of 123/0. I have tried setting the temperature to something lower like 50, and then it says 123/50. Is this a firmware or a hardware issue do you think? C) My Y-axis sensor works, red light comes on and everything, but when I autohome, or begin a print, it ignores the signal and keeps grinding the motor to the left, past when it should stop. I have tried swapping it with the x-axis switch and I can command the x-axis to stop, but not the Y. I have also tried a couple of different configurations, like trying to plug it into Y+ on the board instead of Y- and that didnt work either. As for the problems, double check if everything is correctly wired, on the bed and on the endstops, according to the manual, if possible post a picture here for a double check. - A defective endstop input that can't read it's correct state. As a extra check try connecting the Y endstop to the X axis and vice versa and check if the result changes.